Saudi-led coalition warplanes pounded rebel positions across Sanaa overnight, only hours after the UN envoy to Yemen arrived in the rebel-held capital, residents said Saturday. Among the air strike targets was a house of ousted president Ali Abdullah Saleh in his home town of Sanhan, south of the capital. The raids came after Saleh said, in an interview broadcast late Friday, that he had rejected a Saudi offer of "millions of dollars" to oppose the Iran-backed Shia rebels. Saleh was forced to resign in early 2012 after waging a bloody crackdown on a year of protests calling for an end to his three decades of iron-fisted rule. His forces have been backing the Houthi rebels who seized Sanaa in September before expanding across other parts of the country. The interview was aired on the Beirut-based Al-Mayadeen television channel whose presenter said he spoke from Sanaa. But the former strongman no longer resides in his Sanhan house which has been targeted occasionally since the Saudi-led coalition launched their air strikes on March 26. 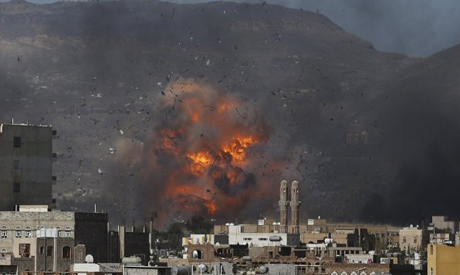 The latest air raids also hit the rebel-held air force headquarters in Sanaa, arms depots in Sanhan, as well as the Dailami air base, also in the capital, witnesses said. Other raids targeted rebel positions in the oil-rich eastern province of Marib and the western region of Hodeidah. The raids came only hours after UN special envoy Ismail Ould Cheikh Ahmed flew in to Sanaa on Friday for talks with political parties, according to a rebel-run website. A conference on Yemen which was due to take place in Geneva last Thursday was postponed, in a fresh blow to UN efforts to broker peace in the country where the conflict has killed almost 2,000 people since March. In Friday's interview, Saleh renewed calls for talks in Geneva between the Yemeni parties, as well as negotiations between Yemenis and Saudi Arabia -- which he accused of seeking to sow "sedition" in the war-torn country. But "sooner or later we will hold talks with Saudi Arabia," said the former president who himself belongs to the Iran-backed Houthis' Zaidi offshoot of Shia Islam. Saleh said the Geneva talks, which he himself first proposed, should focus on "power transfer, choosing a new authority, and the return to elections," as well as "condemning the Saudi aggression". And while he indicated that the rule of President Abd-rabbo Mansour Hadi "is over", he insisted that "I will not accept power for myself or my son" Ahmed, who led the elite Republican Guard troops during his rule. As for Iran, which he said he was not directly in contact with, Saleh said the Shia-dominated Islamic republic "does not pose a threat to Yemen at all".